You talk about everything. You share the big events and small victories, but there’s one conversation you probably haven’t had…it’s time to have the talk about how you want to be remembered. It can make the difference of a lifetime. Sharing stories with those who matter most isn’t just important today, it will be especially significant when it’s time to commemorate a life. Have the Talk of a Lifetime encourages families to have conversations about life and what matters most. These discussions can help families make important decisions about how they wish to remember and honor the lives of their loved ones. Through meaningful memorialization – that is, taking the time to reflect on the unique life of a loved one and remember the difference they made – families and friends take an important step in the journey toward healing after death. Today, individuals and their families have more options for memorializing their loved one at the end of life. Memorialization is so much more than it used to be. It can reflect a person’s life story, their values, interests and experiences. It is transformative, healing and comforting. Meaningful memorialization planning starts when loved ones talk about what matters most – memories made, lessons learned and how they hope to be remembered. We are pleased to offer families in our community a free guide, Have the Talk of a Lifetime. 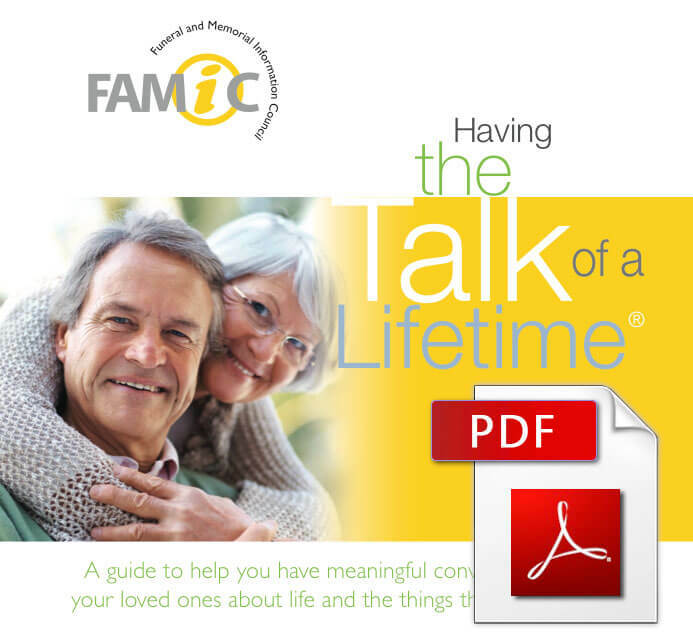 This fillable PDF workbook will help you begin to have meaningful conversations with your loved ones about life and the things that matter most. Please call us for assistance or additional information about your memorialization options.